Drywall is one of the most popular building materials. 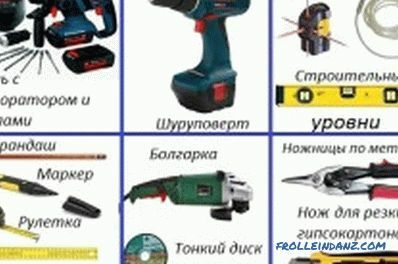 It is used for leveling surfaces, construction of partitions during redevelopment, installation of various structures. 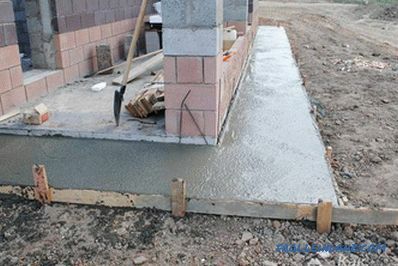 It is easy to work with the material; even a beginner home master can do it. 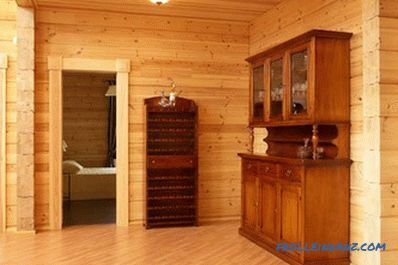 It is necessary to begin installation with a construction of a wooden or metal framework. Despite the fact that the metal base is more durable and easier to assemble, many prefer a wooden frame for drywall. 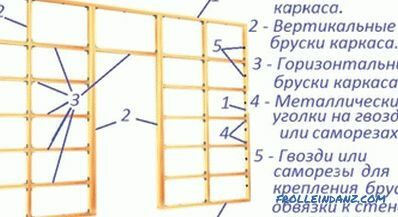 Schematic of a wooden frame for a drywall construction. The use of the frame makes it possible to hide the imperfections of any surfaces without affecting the usable floor space. Its construction must be taken seriously. The success of further work depends on how accurately it will be calculated and designed. To construct the framework, it is necessary to prepare wooden blocks. 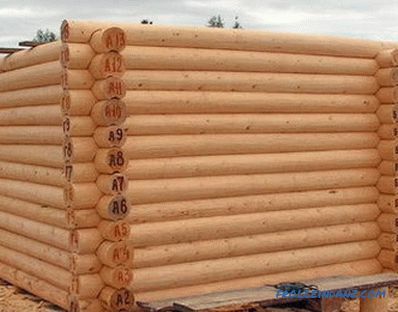 This should be coniferous wood, the best option - pine. Mounting a framework for a gypsum board construction of wooden bars. The material must be flawless and well dried, so that during operation it will not deform and withstand heavy loads. Before starting to work with the material, it should be treated with an antiseptic composition. Antiseptic should not be toxic, since the work will be carried out indoors. It should penetrate easily into the wood, not decompose, not be washed out and not have an odor. Do not use antiseptics on an oily basis. This may adversely affect the health of the occupants. The thickness of the bars must be at least 40 mm. Permissible humidity - no more than 15-18%. However, the thickness is directly dependent on the size of the future construction of GCR. For example, when building partitions should pay attention to its width and height. The larger these values, the larger must be the cross section of the bar. For wall cladding or ceiling width of the material is selected based on how much usable space I would like to save. 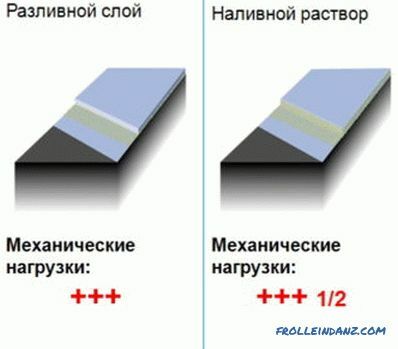 If the surface is very uneven, you should use the bars of different sections. Figure 1. Rigidly fixing the wooden frame to the wall. 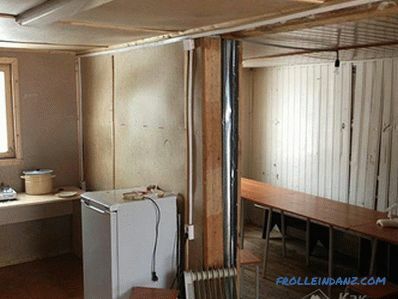 To fix the wooden frame on the walls or ceilings, there are two ways. One of the most reliable is a rigid mount directly to the wall (Fig. 1). First, the binding is performed. If the frame is constructed on the ceiling, the bars attach to the walls. If the wooden frame is made for the wall, the fixing of the bars is carried out to the ceiling, the floor and to the walls located perpendicularly. To the ceilings or walls, the frame for plasterboard can be mounted in another way: with the help of metal brackets. The advantage of this method will be quick installation, and the disadvantage is the low rigidity of the structure. 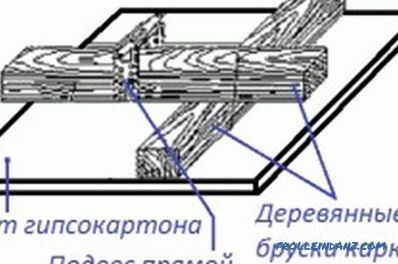 Before making a wooden frame, for example, on a wooden ceiling, it is necessary to carry out a marking (Fig. 2). To do this, determine the lowest point of the ceiling. From it you need to retreat 50 mm and draw a horizontal line around the perimeter of the room. On this contour will be fixed rail for strapping. To draw an exact horizontal line at the corners of the room, marks are made at the required level. Between them, the cord is stretched and a straight line bounces off. In the rail you need to drill holes for fasteners with a diameter slightly larger than that of a screw or a screw. Figure 2. 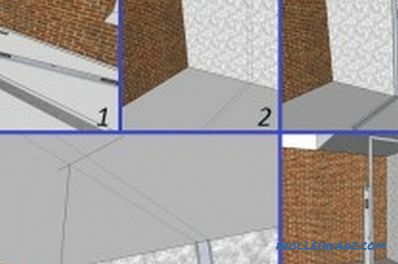 Framework marking: 1 - prepare a pencil, a corner ruler and level, 2 - using a level and a pencil, you should make an even marking for fixing profiles, 3 - the profile is applied to the markup and screwed to the floor and wall, 4 - marking the attachment point with a plumb line, 5 - frame assembly and level check. The rake is applied to the line on the wall and the marks of future fixings are transferred to the surface with a pencil. Then holes are drilled into which dowels or wooden plugs for screws will be plugged. Reiki are fixed along the entire perimeter. The next step is to install the foundation of the bars on the ceiling surface. The mounting step of parallel bars must not exceed 800 mm. This will ensure the reliability of the future design. Perpendicularly mounted bearing bars, which will later be installed drywall. The skeleton for a wall can be assembled on the floor and only then fixed on the wall. The size of the wall on which the drywall will be mounted is measured. From the result, subtract 5 mm on each side and cut the bars of the appropriate sizes. Assemble a frame of 2 horizontal and 2 vertical bars. Additional slats are mounted in 600 mm increments, perpendicular to them crossbars are fixed. 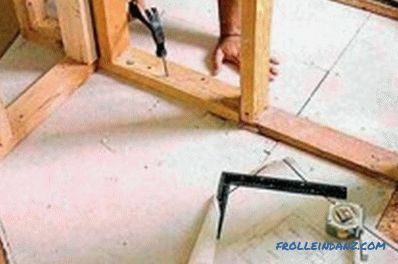 Fixed frame dowels, screws or dowels, nails around the perimeter of the wall.With this method of manufacturing the heat-insulating layer is attached directly to the wall, and the frame closes it. In the manufacture of the frame, you can do without the transverse bars, if its length does not exceed the length of the plasterboard and there are no door or window openings on the wall. Before you build a frame for drywall, you must draw a drawing of a future partition on which to mark the location of the doorway. 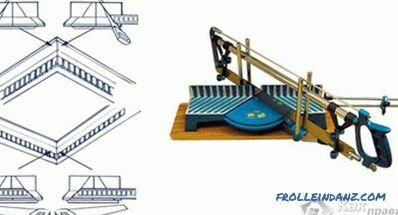 When calculating the rigidity of the structure, you should consider the number of horizontal parts. Tools for mounting the frame. Bars: for vertical posts the cross-section is not less than 40x70 mm, for horizontal - 30x50 mm. The installation of the frame begins with fastening to the floor, walls and ceiling trim strips (Fig. 3). For this purpose, self-tapping screws and dowels are used, if the floors are concrete, and nails, if the floors are wooden. Anchors will be needed for mounting on the ceiling. First, the mount is on the ceiling. The boundaries of the future partition are marked, only after that the bars are mounted. With the help of a plumb line is marked on the floor. For more accurate markings on the walls, you need to make a few marks. After the marking is completed, the timber is fixed on the floor. Figure 3. The installation of the frame begins with the fixing of the trim strips to the walls, floor and ceiling. The next step is to mount the vertical trim that connects the ceiling and floor bars. Vertical racks will carry the main load in the design, so the mount should be as strong as possible with a pitch of fasteners not exceeding 400 mm. 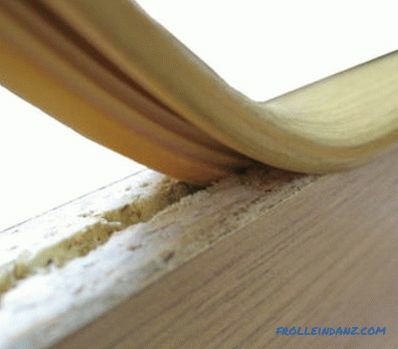 If the main walls in the room are not made of durable materials, then the dowel-nails are used for fastening. You can drill holes in the wall into which you place corks of wooden pegs and screw in screws or nails. If the main walls are strong and smooth, then the strapping can be fixed on straight hangers, which are used for the metal frame. When the harness is ready, racks are installed in 600 mm increments. This step will allow you to attach each standard sheet GCR on two racks. Fix the rack can be using metal corners. 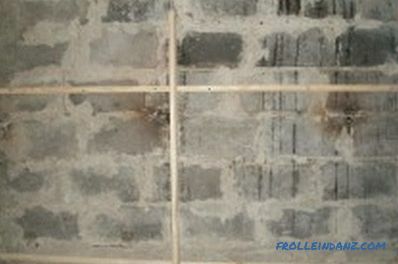 For horizontal lintels, a bar is used with the same cross-section as for the whole structure. They are fastened with screws. For greater reliability, metal corners can be used. The opening for the door in the new partition requires reinforcement. For this, additional racks and horizontal lintels are used. The threshold will be the lower part of the frame. The laying of communication in such a partition is not recommended. However, if it is necessary, then holes of the required diameter are drilled in the racks. 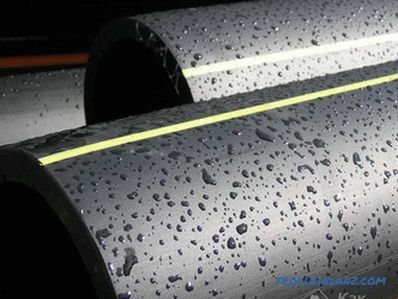 The electric cable is laid in special protective corrugated pipes or tin boxes.